FAQ: Can I use a relay module to control motorized blinds and shades? Our ZWAVE® shade and blind motor controller (DCC-ZWAVE-12R) can be also be used to activate our radio remote control shade and blind motors using our surface mount radio wall switches, and other interfaces. The advantage of this configuration is that you can still use our hand held remotes and our very popular wireless motors with built-in batteries. Some models last up to a year without a re-charge (with daily use). 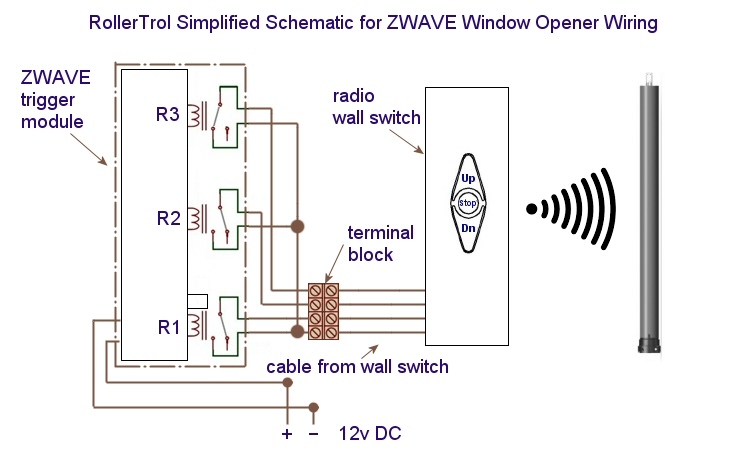 In the previous article in this series (part 2), we examined the ZWAVE relay module that can act as a trigger to control various devices like our window and skylight openers, using our wired wall switch interface. In this third article we will show you how you can connect it to an interface switch to control our radio controlled shade and blind motors. You can use any Z WAVE hub, such as Razberry Pi, Staples Connect, Fibaro, Wink, SmartThings, Vera, Homeseer, Syslink, Zipr, Xuan, Xuan, Homelive, Isis, Nexia, etc. ZWAVE home automation systems invariably include an app or browser access to your various automated devices, including blinds and shades. We can pretty well guarantee you that once you have been operating your window shades by remote control, you'll never want to go back! 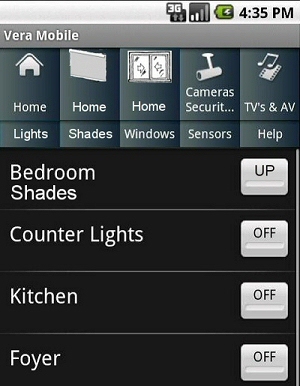 The advantage of our radio motors is that you can still use our inexpensive remote controls to control your shades too. If you retire and forget to put your phone on your night table, it doesn't matter because you can control your wireless bedroom blind motors with an inexpensive wireless wall switch mounted conveniently on your headboard, or wherever you like. If you take your phone to bed, you can use that too. The ZWAVE control module can be interfaced with our special input/output wall switch interface, with the wiring concealed, in a very similar manner as the wired switch we saw in part 2. In fact we will use almost the same schematics and pictures that you saw in the previous article. In the previous article ZWAVE article about motor control we examined the basic operation of the z wave trigger module, which is also used in this blind and shade control scenario. It has 3 single pole, normally open relays (a relay is a switch that can be triggered by electronic circuitry) that are controlled by the zwave signal. 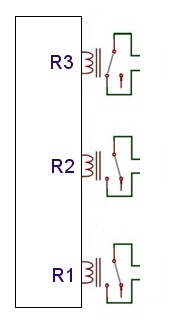 In this simple schematic, you can see the 3 relay representations (R1, R2, and R3) clearly. R1 and R2 are shown in the 'open circuit' position (not activated), while R3 is shown in the 'closed' position where it completes a circuit (activated). These 3 switch closures trigger the radio wall switch, which in turn transmits a VHF radio signal to the designated blind motor(s). You can control an almost unlimited group of shades simultaneously with this system. Our customers will often have one of our multi-channel hand held remotes in the room, which will provide individual shade control, when desired, while the zwave unit provides group control. In the diagram below, we have replaced the wired wall switch and window opener with the radio wall switch input output (I/O) module and a tubular shade motor. There is no separate header on the radio wall switch, it is wired directly to the terminal block. It then sends a signal to the radio receiver inside the motor, with the appropriate commands for open/close/stop. As before, the 3 solid color wires from the bottom side of each relay connect together to form a common ground. When the relays close, the circuit to ground is closed, activating the open/close/stop switches via the cable. The ZWAVE relays are actually connected in parallel with the push button switches on the radio wall switch, and they do exactly the same thing as if you had pressed one of the switch buttons - close the circuit to ground. This action activates a transistor circuit, which in turn transmits the radio control signal to the motor. The 433 MHz VHF signal is a relatively low frequency signal, which allows it to pass through walls very easily, reaching any part of a typical home (in most cases). Note that there is no power connection to the radio wall switch, it operates on an internal button battery that lasts for years. There is also no wiring to the motor; if it is a battery motor it does not require any wiring at all, and if it's a standard radio motor it will draw power from a local power supply plugged into AC somewhere. Power: The red and black ZWAVE module wires are for power (red: +12v and black: ground). Note that in the picture there is not a parallel set of wires for powering the radio wall switch as it operates on an internal button battery (for years with daily use). The current draw of the ZWAVE module is quite low (~25 ma). 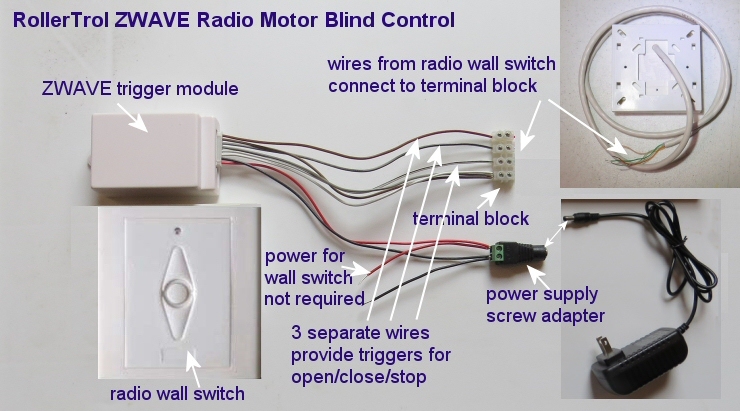 The radio controlled blind motor is often a self powered motor with a built-in battery (and solar option), or it may be externally powered by an AC power supply located nearby the shade or blind. Here is a picture of the wiring, and we have shown a 12v AC power supply as the power source, but it could just as easily be a 12v battery with a solar or AC powered trickle charger. 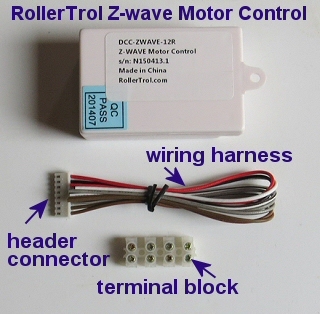 This above is essentially what is in the ZWAVE roller blind motor kits in the kit section of our online store (click to open in new window). 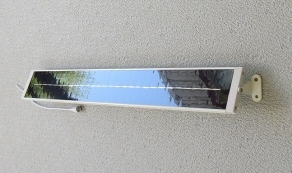 We also have 'in window' solar power options for our battery motors, as shown in the picture at right. They are specially designed elongated units for window sills that have a low profile. Many customers have reported that they have never had to charge their battery motors, even with daily use. This system can control a group of window blind motors, consisting of many window shades triggered by the same ZWAVE controller. The radio wall switch also functions as usual, and the hand held room remotes will also still work normally. In the next instalment, we'll show you how to set up the ZWAVE trigger module in your ZWAVE home automation system, using Vera as an example. The configuration process in other ZWAVE automation hubs will be very similar because zwave is a standardized mesh protocol.